Yesterday was a major political event in Egypt; millions of people turned out on the streets to demand the resignation of the president, Muhammad Morsi. The "Tamarod" (Rebellion) campaign is an interesting case of social mobilization, and a powerful rebuke to the behavior of the Muslim Brotherhood-led government of the past year; it also raises important questions about the limits and strengths of electoral democracy for determining what counts as representing "the people." That said, I don't think I, in particular, have anything to add to this conversation; I'm following Mada, the new news website from the team that used to run Egypt Independent, as well as the new Egypt Independent, and journalists on twitter like bassem_sabry and ghazalairshad. If people want me to do a links roundup, I'm happy to put one together. Although I spent yesterday glued to my twitter feed following what was happening on the ground, my deepest focus was on protests by Egyptians outside of Egypt in solidarity with Tamarod. Egyptians abroad have been highly political mobilized by Egyptian politics over the past two years; the hashtag #egyabroad on Twitter is always active, presidential candidates campaigned in diaspora communities, and activists from Egypt have traveled to diaspora communities to present their work. None of my writing on these actions has come to print yet, but I generally argue that demonstrations and actions by Egyptians abroad serve to figuratively transport the diasporites participating back into their homeland, and to extend the political ground of the homeland fully into diaspora. Yesterday's protests fall into this category; the Egyptians around the world who joined in objecting to Morsi's rule were a part of the demos of Egypt, and were engaged in claiming the right to judge his policies. Here's the list of protests I was able to count yesterday, based on what I saw on social media. I'm also including links to some of the tweets/posts with best photos of the protests. I had the passing thought as I looked at these of "but are there any protests in the Gulf?" And then the immediate answer, "Duh, of course not." Public protest is, if not banned, highly restricted in the Gulf states where Egyptians emigrate, and Qatar and Saudi, in particular, have been major supporters of Egypt under Brotherhood rule, which makes the possibilities for protest even smaller. But this actually is a conflicting effect. Something that my interviewees mentioned when I was in Cairo is that people who emigrate to the Gulf are different than people who emigrate to Europe or North America--they tend to care more about money and financial safety, and less about freedom and rights. They are also less highly educated and less political. Now, this might be a stereotype (and people I heard it from, who identified themselves against the type of people who go to the Gulf, themselves talked about the possibility of moving there, so obviously the idea is not exactly like the practice), but it probably also has some interesting implications for what the political engagement of Egyptians in the Gulf might be like. Another truism, this one in policy circles, is that Egyptians in the Gulf voted for Morsi, while Egyptians elsewhere voted for Shafiq (his secular but Mubarak-allied opponent). So how can we untangle suppressive protest environment, possibly different social attributes, and different political views in understanding the position of Gulf Egyptians during moments like these? If your answer is, " ajnabieh, that sounds like an excellent grant proposal for a research trip," you read my mind. The protests that got the biggest circulation (that I saw--I obviously might be wrong) on social media were London and New York. My networks are New York-centric, though. Again, something else I've noticed in my research: Egyptians in Egypt who are themselves a part of the transnational class are promoting and circulating images of protests abroad. That picture montage I linked above the cut was posted by Bassam Youssef, the satirist, and both Egyptian Streets and Cairo Gossip had posts about protests. So Egyptians in Egypt who are politically engaged don't differentiate between diaspora action and action at home, at least not in the aggregate. I meant to do this earlier today, but my brain was all taken up with writing. How are your writing lives, comrades? I got all my easy summer projects (abstracts, revisions, etc) out of the way, and now I'm staring down the barrel of a book proposal and a couple of articles. Boo hiss. Anyway, four things I read recently that I thought were worth passing on. Arizona Everywhere: Immigration Policing and the United States’ Expanding Borderlands is a frankly horrifying piece on the powers of the US Border Control and their actions policing immigrants well inside what we think of as the US border region. I'm particularly appreciative of this piece for its analysis of Sodus, New York, which is about half an hour from my house. I have the slightest of bones to pick with the section on Detroit, however: while the author is absolutely right to point out the consequences of increased border patrols on the Latin@ community, he neglects that there's another community in Detroit that is the focus of Border Control attention: the Arab community, who has been under particular security surveillance and has seen a rise in deportations as well. In fact, I'd wager that the rationale behind the huge quantity of border agents in Detroit is tied to the Arab community there--and that other communities are suffering collateral damage because of it. Children of Egyptian Diplomats: Caught Between Two Worlds is a short piece on the experience of being a transnational Egyptian. I'm thinking about this a lot lately, as it's research relevant. The AKP's Accountability Problem and The Might of the Pen(guin) are two great pieces on the current protest cycle in Turkey. I appreciate the former for the way it focuses on horizontal accountability, meaning the sharing of power among different governing institutions; it's not that the government lacks democratic accountability in the sense of having been fairly elected (nobody's disputing that, at least according to what I've seen), but that the AKP is overly centralist and assumes that, once it's in power, it doesn't have to be accountable ever again. It's good to see a piece of analysis that takes Turkey seriously as a country with democratic institutions, while also recognizing the seriousness of the problems at hand and the real lack of legitimacy the AKP has in many quarters right now. The second piece, which explains some of the symbolic politics of the demonstrations, demonstrates how significant this portion of the population is: they're media-makers and creators, which means they have an effective means of communicating with the population and bringing people over to their side. A numbered list of 15 quotes, with the title "Who Said It: Mitt Romney or Mr. Burns?" 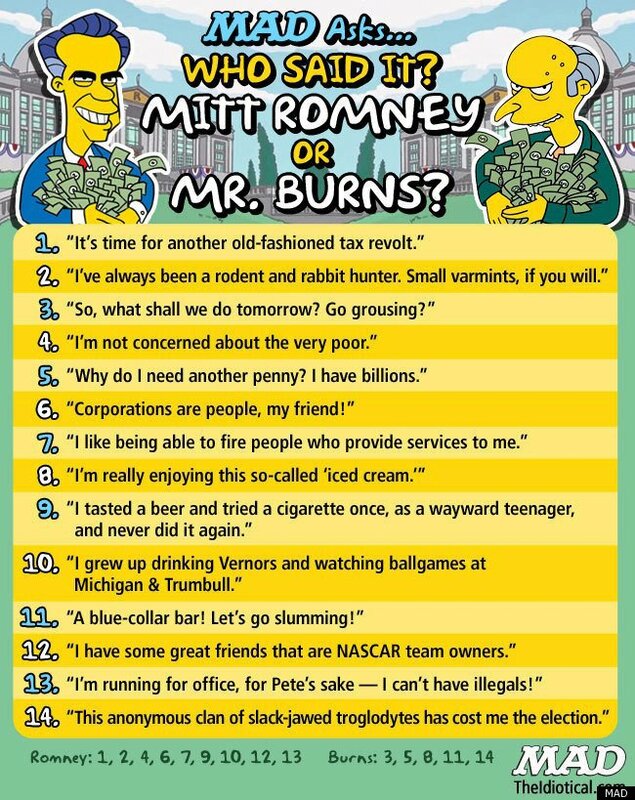 Cartoon images of both Romney and Burns are on the top. *Interestingly, images of Mr. Burns were used against Angela Merkel in Germany during a recent campaign. There, it wasn't a criticism of wealth, but her public support for nuclear energy. How do I know this random piece of trivia, when I otherwise know nothing about German politics? Because I peer-reviewed an article about it. Coming soon to an issue of TWC near you! ** Wait, where does the "I am your father?" moment fit in that metaphor?